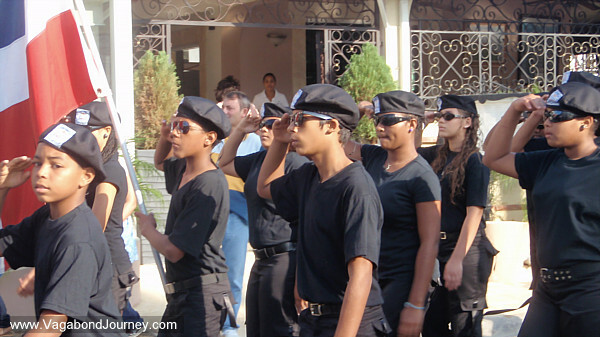 SOSUA, Dominican Republic- The beating of a legion of drummers woke me up from a sound slumber, and I stumbled out the door to see who or what invading army was marching into town on the morning of February 27 in the Dominican Republic. I found school children. Thousands of them. Published on March 5, 2010 by Wade Shepard Follow me on Twitter here. I found school children. Thousands of them. They were all dressed in sharp uniforms, the styles of which divided them by school and class rank. 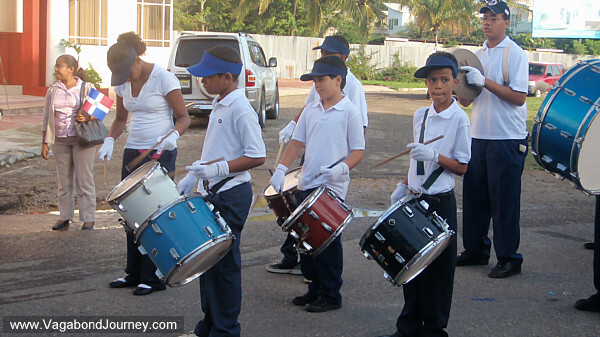 The children stood with those of their contingent, banged on drums, cheered, and danced. Some of the uniforms were militaristic in style, while others were cheer leading outfits. I am unsure how the two styles blended themselves in harmony, but as I watched the parade roll by, its normalcy was the main attribute that stuck out to me. It is normal all around the world for children to dress up in military marching suits, beat drums, and parade down the main streets of a city in unison while bearing the colors of their country’s flag. “What is going on?” my wife asked a Dominican woman who was also a spectator. My wife needed to ask no such questions, independence day celebrations are the same all over the world — noise, tinsel, flare, and school children. School children dress in their country’s tricolors and march through the streets, as they are the ones who reteach the lessons of the fatherland to the generations which bore them. Dominican independence was not a cut and dry deal. After claiming independence from Haiti in 1844, the debarkation of independence that this parade commemorates, vying powers in the reclaimed country seemed to hold sway only as much as they could minimize their opponents. All the while Haiti continued invading from the west. Two major powers arose who ruled on the force of their own volition alone. There were no votes, control was taken by the man strong enough to take it. Though both factions wanted to turn the country over to stronger world powers in fear of another Haitian occupation. One faction preferred Spain, while the other sought to annex the Dominican Republic to the United States. 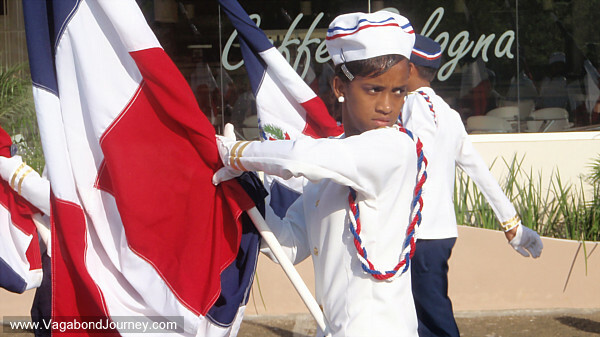 The Dominican Republic was eventually given back to Spain — the only country in Latin America to go back to the crown. But this did not last, as resistance from Haiti assisted guerrilla forces led Spain to re-abandon the island two years later. The other wing of power then reasserted itself and tried again to put the Dominican Republic under the auspices of the the United States, but the Americans eventually declined the offer. The Dominican Republic was then on its own — independent, if not initially by choice, then by lack of a taker. But soon enough the USA was back. They wanted control of the Dominican Republic’s customs to assist in their own geo-political squabble with Europe. In 1905, control of customs was handed over the United States, and they in turn were to pay off the Dominican Republic’s international debts. In 1916, the United States physically occupied the Dominican Republic. A great deal of infrastructure was created, the country, for the first time, was completely linked together by road, a national army was formed, and vying warlords were minimized. But opposition to the occupation grew in the Dominican Republic and in the USA, and in 1922 the Stars and Stripes saw their way out — though they still retained control of customs. “If a country does not have control of their own customs, they are not really independent,” a member of Sosua’s original Jewish colony told me in conversation a few days ago. If you take the Jews, we will return control of your customs. In 1947, a stream of 500 Jews began to arrive in the north of the Dominican Republic, and the country was again given control of its customs. 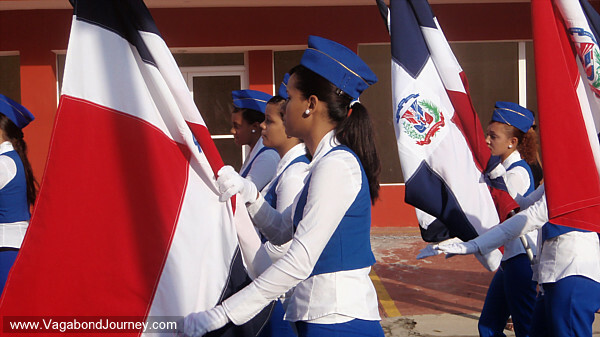 The Dominican Republic was now a completely independent nation. Thanks Wade, good history lesson. I’m curious what you hear about Haiti, being that your on the same island. Nothing about Haiti. Absolutely nothing. Besides the Haitians who are here in the Dominican Republic, Haiti may as well be on the other side of the world.